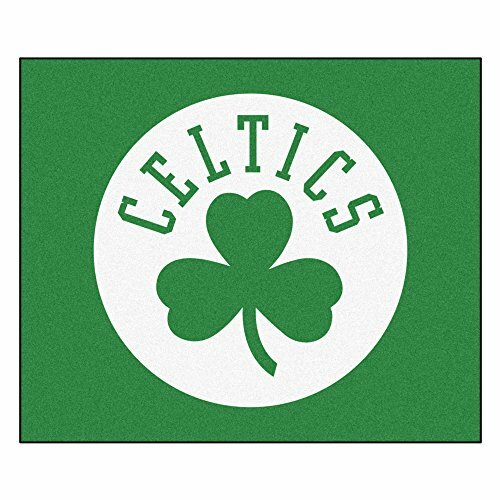 FANMATS 19427 NBA - Boston Celtics Tailgater Rug , Team Color, 59.5"x71"
Start showing off your team pride with a Tailgater Mat from Sports Licensing Solutions. Made in the U.S.A. with 100% nylon carpet in true colors and non-skid recycled vinyl backing. Serged borders add durability and style. Officially licensed and chromo jet-printed in true team colors for vibrant, lasting color. FANMATS 19458 NBA - Brooklyn Nets Tailgater Rug , Team Color, 59.5"x71"
FANMATS 19429 NBA - Charlotte Hornets Tailgater Rug , Team Color, 59.5"x71"
FANMATS 19433 NBA - Cleveland Cavaliers Tailgater Rug , Team Color, 59.5"x71"
FANMATS 19435 NBA - Dallas Mavericks Tailgater Rug , Team Color, 59.5"x71"
FANMATS 19437 NBA - Denver Nuggets Tailgater Rug , Team Color, 59.5"x71"
FANMATS 19439 NBA - Detroit Pistons Tailgater Rug , Team Color, 59.5"x71"
FANMATS 19462 NBA - New York Knicks Tailgater Rug , Team Color, 59.5"x71"
FANMATS 19478 NBA - Toronto Raptors Tailgater Rug , Team Color, 59.5"x71"